Good quality but pricey for a TN panel. FreeSync; high refresh rate; cheaper than the Asus RoG Swift. Still TN, and not a brilliant TN; ghosting with FreeSync; fairly pricey. Our first FreeSync monitor touches down, but can it give the pricey Asus Swift a run for its money? Acer's new XG270HU is the first monitor we’ve tested that offers AMD’s framesyncing technology, FreeSync. It’s a highend, high refresh rate panel that ought to deliver the best possible FreeSync experience at a fraction of the cost of something like Asus’s range-topping Republic of Gamers Swift PG278Q screen. In case you're wondering what FreeSync is, it's essentially a technology that leverages the Adaptive Sync part of the DisplayPort 1.2a protocol, to enable AMD graphics cards to speak to compatible monitors and display frames from the GPU when they’re ready. Nvidia’s G-Sync and AMD’s FreeSync are both designed to do the same thing, but the basic difference is that the green team requires the monitor manufacturers to license the G-Sync tech and install a specific hardware module in their displays, to sync with GeForce GPUs. AMD’s tech is based on the newly established DisplayPort 1.2a Adaptive Sync protocols, and as such needs no new hardware, nor licenses. Because, y’know, it’s free syncing. 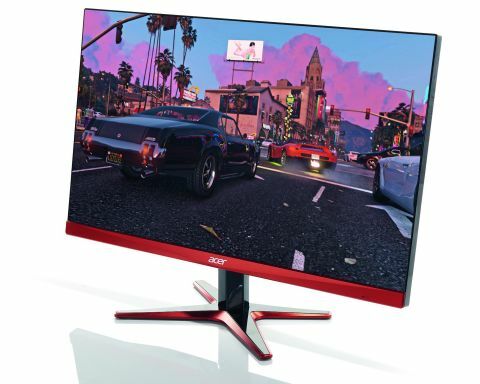 Initially, we thought the Acer had grabbed the same AU Optronics panel the Asus Swift is using and, given that it’s almost $300 cheaper, that would be a major feather in the cap for both Acer and AMD’s FreeSync initiative. A quick specs check would seem to corroborate that initial thought—both are native 2560x1440 panels; they both use TN tech with a 1ms response time; and they both run with a 144Hz refresh rate. But there’s one key spec that separates the two. The Swift is a true 8-bit screen while the XG270HU uses Frame Rate Control (FRC) to enhance its 6-bit monitor. Putting the monitors cheek-by-jowl, you can see they’re most definitely not the same. Aside from possibly a slightly improved viewing angle for the Acer panel, it loses out to the Swift in terms of image quality. Sometimes only by a touch, but sometimes by a wider margin. The contrast and gradients on the Acer are only slightly behind the expensive Asus monitor, but it’s a long way behind when it comes to the black reproduction. It’s also not so hot on the whites either, but both being TN panels, neither are exactly paragons in that regard. The addition of the G-Sync license and hardware isn’t the only reason the Swift is more expensive. The Acer is just making do with a limited tilt stand—there’s no height adjustment, which is a bit of a miss considering TN’s paucity of vertical viewing angle. There’s also a noticeable amount of ghosting on the panel when you’re using FreeSync, too, something Nvidia claims isn’t present with G-Sync panels because its hardware is set up specifically for each panel to operate optimally. With FreeSync, AMD says it’s up to the panel manufacturers to ensure dynamic refresh rates and pixel persistence is tuned for each screen. Our first experience of FreeSync isn’t brilliant, then. But it wasn’t with G-Sync, either. This is a new technology, so the early screens aren’t going to be perfect, and the XG270HU most certainly isn’t that. At $500 it’s also not really toeing the line that FreeSync isn’t adding a price premium—you can pick up a 27-inch IPS 1440p panel for around $100 less. Still though, FreeSync is great if you’re already running a compatible AMD graphics card. Games certatinly run much smoother than they do with V-Sync alone, and this Acer panel doesn’t need any messing around with to get that up and running. We do, however, still baulk at this price for a TN screen, especially when IPS or MVA Adaptive Sync capable screens are on their way.